Sketchpad is a brand-new class from Kelly Purkey, spinning off from her series of successful Sketchbook classes. Sketchpad is a downloadable, self-paced class featuring 12 original sketches, 35 exclusive layouts from Kelly + and her talented contributors (including yours truly! ), 35 MORE sketches made from those layouts, and 12 amazing cards based on the sketches from the talented, Kristina Werner... all in a full-color 75 page PDF. Visit Kelly's blog for more details on the class and how to purchase (or keep reading for your chance to win a copy of the class!). Can I just say how ultra flattered I am to be asked by Kelly to contribute to this class? Like, pick-me-up-off the-floor-cuz-I-just-fainted-with-too-much-excitement! To be among these 24 ladies is like a dream come true:Nichol Magouirk, Davinie Fiero, Kelly Noel, Marcy Penner, Amy Tan, April Foster, Stephanie Howell, Lisa Truesell, Keisha Campbell, Cindy Tobey, Jen Jockisch, Liz Tamanaha, Shimelle Laine, Kelly Goree, Kinsey Wilson, Jennifer McGuire, Erica Hernandez, Celine Navarro, Heathyr Hintz, Robyn Werlich, Paige Evans, Maggie Holmes, and Geralyn Sy. I looked through the class PDF and holy moly... It's stellar. Definitely worth every penny (and really, $15 is a STEAL for this class IMHO!). I used nearly all products from the new Chap line by American Crafts. It's soooo great for scrapping boys! Kelly is offering a free copy of her class PDF to one lucky ducky person! Leave a comment on this post by Wednesday November 9th 2011 telling me what your plans are for Thanksgiving (sure, why not? :) and I'll announce the winner that day. Best of luck! Oh my goodness, Thanksgiving huh? It is November isn't it? I think I had better start making plans! Love your weave! For Thanksgiving, we'll be in town, but celebrating with my side of the family, although we haven't decided if we'll be hosting, or having the meal at my parents' new place. Looking forward to seeing everyone though, and meeting my new nephew! I am looking forward to some serious family time this Thanksgiving. Thanks for the shah ce to win. we're hosting this year! just the 3 of us, my parents and my grandma! Really like the weave! I'm the family cook, so everyone comes to my house to eat (followed by a nap! lol) for Thanksgiving. Celebrating with family at my cousins home. She bought a 33lb. turkey raised by a local FFA student. I will be making dinner for the family at the in-laws house! My plans are to eat and eat. We have a couple of places we could go, but we haven't RSVPed anywhere. We had thanksgiving last month up here in Canada. We had a great family meal! During US thanksgiving, we are going to be in ND shopping our heart out! omgosh...i would totally die and go to scrapbook heaven if i won this sketchpad giveaway...i just love kelly and all of the other ladies involved with the class! it's so awesome that you are contributing too! what are you doing gorgeous? I would love, love, love to take Kelly's class! Thanks so much for the chance! We haven't sealed our plans yet, but for sure it will involve lots of food, family, and fun! oh wow that looks like a great class!!! and your LO sneaks look great!!! For Thanksgiving, I'm going to be hosting here and having my family come and I can NOT wait!!! I'd love to take KP's class! Thanks for the chance! Love that LO and as soon as I saw that CHAP line I immediately thought of you and your precious baby boy! He is TOO adorable! Thanksgiving, hmmm I'll be home with my family and studying for finals! 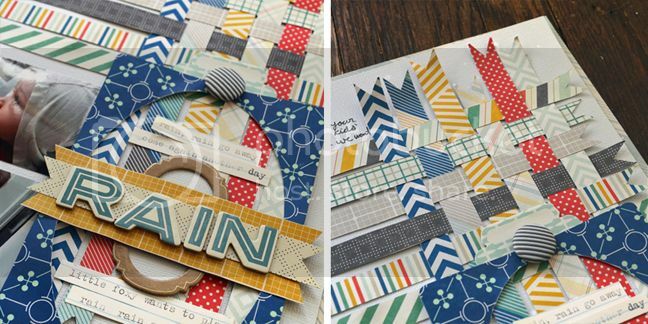 Woa, awesome paper-weaving in this layout!! You are amazing! Since I live in Canada (eh? ), we celebrate Thanksgiving on the first weekend in October. We stayed home and spent some time relaxing, having friends over and appitizer supper. Your sneaks look gorgeous Paige - love that weaving! I think we are hosting Thanksgiving but not sure how many people yet. We do two dinners - one at my family's house and one at my boyfriend's. So much good food! I also started the tradition a few years back of going around the table and everyone saying one thing they're thankful for. I love KPs sketch classes! My entire family is getting together at my parent's house for Tday. It's been a long time since we've celebrated there, so I'm very excited! Thanks for the chance. My family will be all together for the first time in a couple years! Can't wait! Plans for Thanksgiving include riding the Polar Express Train with Grandma and going to see Zoo Lights with Grandma along with Thanksgiving dinner with our newest addition to the family -- our 1 year old newphew! we're having thanksgiving at my aunts house this year, and it's also the day i start housesitting for a week. Spending the day with my in-law family! Oooo... We don't have Thanksgiving here Down Under, unfortunately. Would still want to win the class, though. Turkey Trot in the morning and lots of eating all day after that! Have to replace all those calories burned right? I'm not sure what our Thanksgiving plans our. Maybe we'll even host this year? That might be fun. Either way, looking forward to spending some wonderful time with family and going shopping on black friday! Hi Paige !! thanks for leaving sweet comment on my blog.You asked me regarding those felt flowers...yup they are handcut and handmade. No Thanksgiving plans here as I live in Australia....although would love another day during the year to eat lots of yummy food and spend time with family!! Hope you have a great Thanksgiving with whatever you plan to do!! We're cooking our normal Thanksgiving Day meal... we're just still not sure if any additional family members will be joining us. We're still working out our Thanksgiving plans! I think it will just be my husband and me. I'll make a small turkey and some sides. It will be a nice, low key, relaxing day. I'm cooking for Thanksgiving this year and we'll have a houseful! But one of the guests offered to make all the pies - woo hoo!! Paige, you are totally should be a part of this class! I am inspired by all your creations! Thanks for the give away and I hope I win!! hey Paige!! this sneaks are yummy!! would love to take that class! and it is something that ships easy to France!! :):):)thanks for the chance to win! Thanksgiving normally involves quite a bit of driving ... all around to different family gatherings. Lucky to have family all close by, but it makes holidays a challenge to see everyone! We haven't finalized our plans! It'll definitely involve some driving-either to a waterpark or to a cousin's whom we haven't seen in awhile! Celebrating Thanksgiving in our new home and with friends and family coming to visit! thanks for the sneek peeks! Looks like a FABULOUS class!!!! No plans at all for Thanksgiving as we don't celebrate it over here. We are planning on squeezing in some family time! no thanksgiving day from where i live but would still love a shot at this (: thanks for the chance! thanks for this great giveaway paige!!! i can't wait to see it!! That class looks awesome! I better get me one of those. For thanksgiving I will be cooking for the first time....at my Mother in Law's house! Yikes! I am scared for that! I'd love to win! I'm in law school right now, so for Thanksgiving I'll just be heading home to spend it with family and (hopefully) not doing any reading over that weekend!